Stylish design, NFC pairing, and an evocative name highlight this small outdoor Bluetooth speaker. Audio fidelity, on the other hand, doesn’t make that list. The Voom 20 sounds good. Not great, not bad, just good; albeit with an above-average amount of bass, especially for its svelte dimensions (the speaker is enclosed in an approximately 7.6-inch-long, 2.8-inch-deep, 2.4-inch-tall flattened cylinder). That’s great if you’re looking for a small, very portable, weather-resistant bass monster. But you’ll also want to know that this speaker’s upper mid-range and high-frequencies are a tad limited. Combine that with the constrained stereo separation that’s inherent in a small standalone speaker and I found myself turning the unit to the side or playing other placement tricks so I could pick out the separate instruments. This isn’t the way the Voom 20 sits, it’s tilted for the photo; but the side facing forward is the one with the speakers. This is not really a knock on the Voom 20—you get the same thing out of just about speaker that’s weatherized to this degree (it boasts an IP code of IX5, which means it’s not rated for particle ingress, but that it can withstand a water jet from up to a 6.3mm nozzle. That’s pretty tough.) The materials required to produce an IP code that high tend to be less than acoustically ideal, so it’s a trade-off. My biggest disappointment with the Voom 20 is that there’s no way to utilize it as one half of a stereo pair. There’s no support for True Wireless Stereo (TWS), and there’s no proprietary solution such as JBL Connect. Stereo was the greatest advance in the history of audio playback, and being able to employ a pair of Bluetooth speakers in a stereo configuration goes a heck of a long way toward making them sound better. The Voom 20 has typical speaker controls: on/off/pair, volume up/down, and a play/pause button that doubles as a call answer/hang-up button so you can use it as a speakerphone. As I mentioned at the outset, it also sports an NFC button (aka a touch location). Simply touch your NFC-enabled device’s NFC touch location area to the one on the Voom 20 and the two units should pair. It worked great for me with a Motorola Droid Maxx, but not so much with a Huawei Honor 8. I’m thinking the Honor 8, a great piece of hardware with software issues, is the culprit. 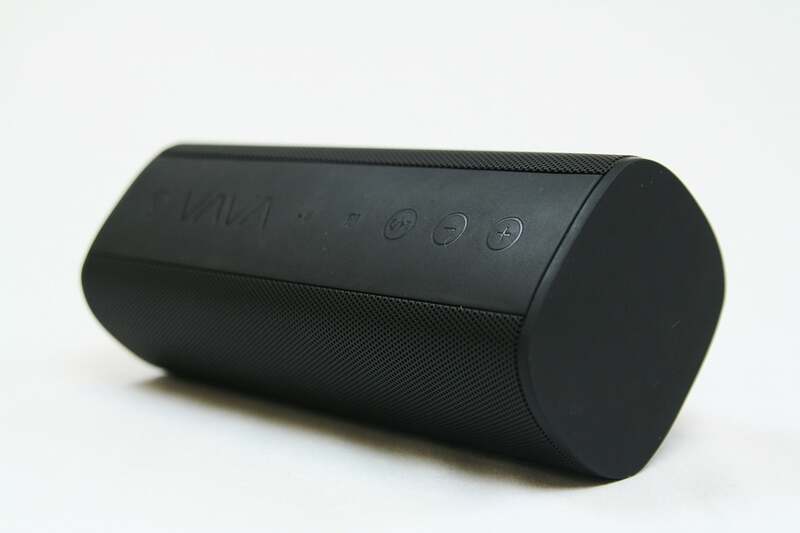 Black-on-black is the color of the day with the Vava Voom 20. It’s stylish, but the controls are a bit difficult to see in low light. The Voom 20 also features a couple of useful enhancements to its play/pause button: Pressing for 3 seconds clears the current pairing, pressing for 10 seconds clears all Bluetooth pairing info, pressing twice redials a phone call, and a long press rejects an incoming call. On the other hand, the black-on-black controls on the top of the unit are a bit difficult to make out in low-light situations. Backlighting would have been cool, but that’s not going to happen with an $80 speaker. Perhaps a medium shade of gray to outline the buttons then. Style versus practicality—the eternal struggle. 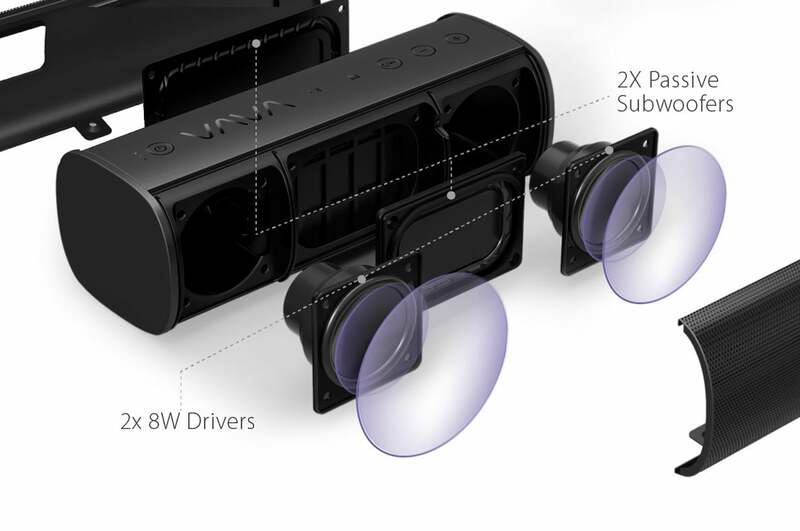 The no-contrast look also makes it easy to confuse the front and back of the speaker, which has grills and passive radiators on both sides, but active drivers on only one side. The easiest way to remember is that the back side has a rubber plug covering a micro-USB port (for charging the speaker’s battery) and a full-size USB port (for charging other devices using the speaker’s battery). There’s also a 3.5mm aux input there. 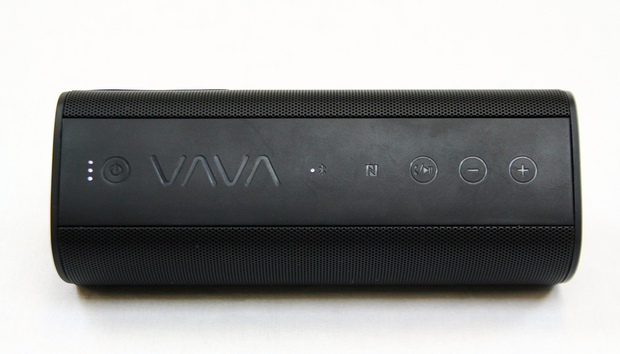 The Vava Voom 20 has a pair of active drivers in front, on either side of a passive bass radiator. A second radiator is mounted in the back of the enclosure. We rarely discuss the stuff that comes in the box, largely because it’s nearly always the same. The Voom 20, however, is notable in two ways. First, both the USB charging cable and the 3.5mm stereo-to-stereo cable have gold-plated connectors. Nice, though ultimately of no real importance. (Some would argue that gold is more resistant to oxidation and corrosion, which can cause distortion when it occurs on contact points—editor.) Second, there’s a nice, snug-fitting cover to protect the unit while you're traveling with it. One accessory is notable in its absence: There's no AC-to-USB power adapter in the box. Most small battery-powered hardware comes with one, because you need it to charge the battery (Amazon's Kindles being a notable exception). In this case, perhaps Vava could have spent a little less on the packaging that you're going to throw away anyway. Style versus price—another eternal struggle. 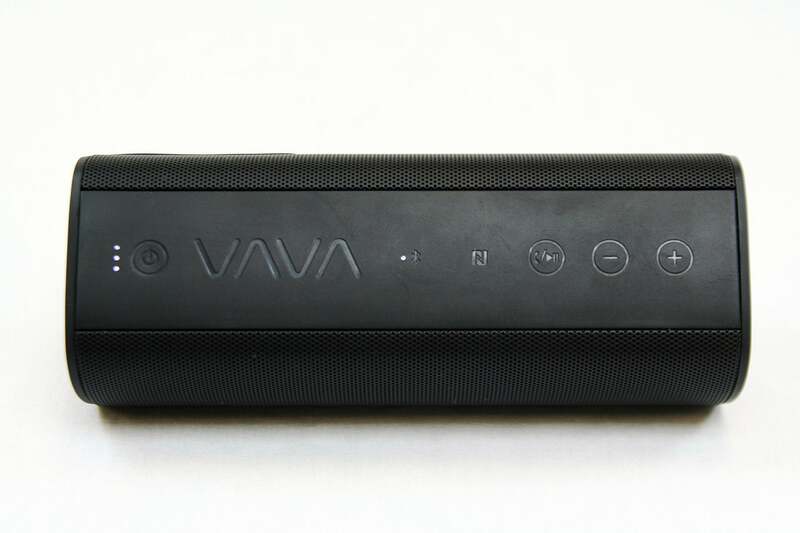 Speaking of batteries, Vava claims the Voom 20 can play continuously for up to 10 hours. I got around 8 hours of constant playback. I saw about 11.5 hours of standby time; synced, but sitting idle and ready to play. This speaker will get you through your event without having to break out those unsightly wires. The Voom 20 is a great-looking speaker that will draw admiring glances from those around you. Its audio performance is only about average for its price, but it puts out above-average bass and NFC is rare at this price. If you like the way it looks, it's worth an audition.